A fresh, floral centerpiece casts a cheerful spell on the dinner table, and hopefully, the diners as well. Keep the warm feelings going as long as possible by nurturing the flowers and plants in fall centerpieces with these tips. Find the Coolest Places in Your Home that have adequate space. This could be a basement, a garage, a back porch (so long as there’s no chance of frost) or a spare refrigerator. Flower shops contain refrigerated cases for a reason. Cut flowers last longer when they are cool. Most likely, your centerpiece doesn’t need to be displayed all day and night. Your other Fall decorations will convey the spirit of the season while the centerpiece takes a breather. Consider keeping it in the cool place until show-time. The foam (also called “the oasis”) that holds the flower and greenery stems must be fully saturated. Most likely, you will have to add water every day. Most centerpieces put a lot of flowers into a limited amount of foam. Florists do their best to add an adequate amount of foam to a Christmas or Thanksgiving centerpiece because they know adults will be very busy during the holidays. The Thorough Method: Find a tub deep enough to submerge the entire centerpiece so that all fronds are covered. Remove any dried, wooden or plastic features. Place centerpiece into the water and watch until bubbles stop rising from the foam. At this point, all air pockets will have been replaced by water. Getting water into the vacuoles on the undersides of greenery leaves helps as well. Drain water (smart to use a bathtub for this job so you won’t have to scoop out or tip over a tub with no drain) and leave plant in tub until centerpiece stops dripping. A Quicker Way: Touch the foam to check for dryness every day. Mix up a watering can with the flower fresh food. Pour the amended water directly over the center into the foam to make sure it’s saturated. Make sure some water stand in the trough around the foam. Fill a spray bottle with water and spritz the arrangement daily as well. The key word above is FRESH. 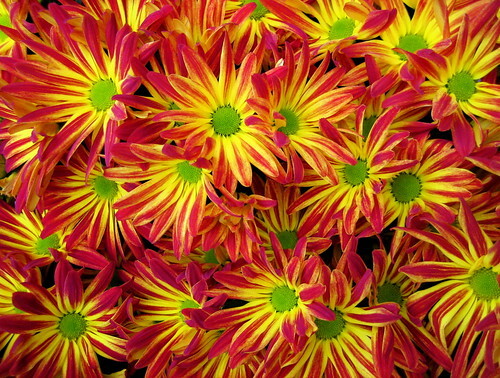 Flower shops can keep flowers in their refrigerated cases for a week without any weariness wilting their pretty petals. Once the consumer gets them home, they may fade in three days, but that’s only because they’ve been picked a full 13 days prior (unbeknownst to the buyer). Florists’ fall decorating ideas may not catch on with their customers, leaving arrangements waiting patiently in cases for a week or more. Further, don’t let yourself be swayed by any florist pushing his or her assessment of trendy fall home accessories and décor. Make sure to ask the florist how old the flowers in your centerpiece are before buying. When dealing with online florists, ask how many days from cutting to arriving at your door. Like any other perishable item, your flowers may not arrive healthy or they may look okay at first but fail within two days. 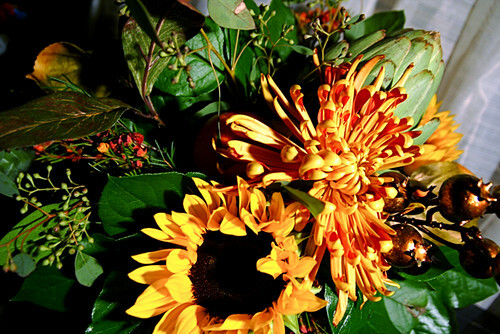 Most online florists guarantee their flowers for at least three days if not a week. If you’re not satisfied, the biggest floral companies employ armies of customer service representatives just waiting to make you happy by fixing their inevitable mistakes. Call them and get a fresh delivery!